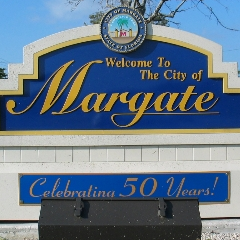 Margate was founded in the 1950s when much the land was still either part of the Everglades or farmland. It then became a town in 1955, when land development became prominent due to an influx of people moving to Margate. Soon after, in 1961, it was officially incorporated as a city. The name of the city itself is a portmanteau of the first three letters of the founder’s last name, Jack Marqusee, and the first four letters of gateway, since it was considered a “gateway” to western Broward County. The city also has a waterpark called Calypso Cove, and three golf courses, The Eagle Lakes Golf Course, the Carolina Golf Club, and the Oriole Golf and Tennis Club.